‘Connections’ is a popular name for the media. A 1978 BBC TV series called Connections explored the history of science and invention. Nearer to home, Methodists have become accustomed to Jim Stuart’s stimulating Connections column in Touchstone. We in the Dunedin Methodist Parish have our own version of Connections, a current affairs column that appears in our weekly bulletin. Launched in 2007, it has stood the test of time. From the outset we envisaged Connections as a timely comment on current affairs and a forum where writers could make connections between the life of the world and the imperatives of the gospel. Connections items make broad brush strokes and are not overtly religious. They apply a liberal perspective to weekly events – from the personal to the international. A team of about 10 writers provide the Connections articles, and the column is believed to be unique among Methodist parishes, and possibly among church bulletins of other denominations as well. Writers have a broad mandate and are entirely free to express themselves and to make their own connections between the gospel and the world. They have written with insight and originality, and in so doing have often produced offerings worthy of a much wider circulation than our own small parish affords. Over seven years, some 330 Connections articles have appeared and they have become as much part of the weekly scene for the Dunedin Parish as the hymns, prayers, and sermons in the services. Many people take the weekly bulletin home so that they can read, reflect upon, and pass on the Connections column. It is well known that the Connections section of the bulletin is regularly mailed to family and friends, and is featured on the Parish website, where the articles often gain prominence in Google searches. Now, thanks to the generosity of a parish member, a 92-page collection of 45 Connections articles is to be published. It is due for release in mid- May, and a copy will be given free to every member of the Parish, with an option to purchase additional copies. 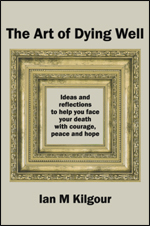 Others copies will be distributed to local libraries and associated churches. Philip Garside Publishing will offer Connections for sale through their website, and will make the book available as an e-book worldwide from late May. Those wishing to order are invited to go to www.pgpl.co.nz. 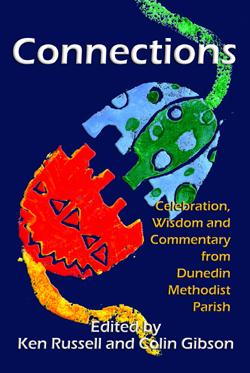 The Dunedin Parish has always given encouragement to its younger members, and we ran a competition among the Y@M (Youth at Mornington) to create a front cover that expresses the Connections theme. The winner was Celia Cannon, who will make her first venture into publishing at age 10. For an example of Connections columns, see the opinion piece by Rev Dr Rod Mitchell on Page 5 of this edition of Touchstone. Arising from a New Zealand context and touching on universal issues, Connections offers 45 responses from the people of Dunedin Methodist Parish to the challenge of being church and living out the gospel in their community. Readers will find themselves laughing, surprised, angered and affirmed, but mostly, nodding in agreement and encouraged in their personal spiritual journey and in their Christian responses to the people around them. Celebrating God’s Creation: What makes a mountain or the ocean a sacred, liminal space? The links between chaos, creation and compassion. The blessings of birds, forest and simplicity. Responding to the Gospel: Following Jesus simply. Raising children well. Resisting greed, giving, receiving and sharing. Remembering loved ones and dealing with loss. Getting people’s attention. New Ideas for Being Church: The value of ritual. Changing location brings new perspectives. What if Jesus returned today? Seeking Justice: Putting people ahead of money. Fighting poverty. Communicating through building relationships. Lessons from the Delhi Commonwealth Games. Working for Peace: Opposing violence against women. Peacemaking, power and politics. The cost and futility of war. Finding personal peace. Visit: www.dunedinmethodist.org.nz for more articles and information.